Okay so some background! 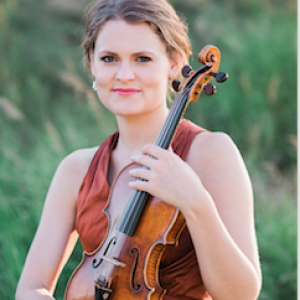 Lydia Sewell is a Kiwi-American violinist from Madison, WI. She plays with the Civic Orchestra of Chicago, Elgin Symphony, Pittsburgh Ballet, Wisconsin Chamber Orchestra, and Wheeling Symphonies. Some of the recordings you hear in Trala are professional recordings done by Lydia. We'll let her take it from here! Hi! I'm Lydia Sewell, and welcome to an ongoing series of conversations regarding the future of classical music. I attended my first concert when I was eighteen months old. Like many other musicians whose parents are professional artists, (my father's a conductor and mother a violinist), I've grown up in and around concert halls. From hearing great classical symphonic works, to meeting soloists like Kathleen Battle and James Galway, I have received an immersive and rich education in classical music. Not surprisingly, I followed my parent's footsteps, and received my Bachelors and Masters in Violin Performance. Like other conservatory graduates, I was set on becoming an orchestral player. But something happened in the second year of my Masters degree. The Pittsburgh Symphony Orchestra went on strike. A world renowned orchestra was closing its doors for an indeterminate amount of time, leaving its musicians without work, an audience without an orchestra, and its management with the financial burden of piecing a machine back together. I had just auditioned for a regional orchestra in Ohio, and after not having progressed past the first round, drove back feeling disheartened and like a failure. Like many musicians after an audition, my mind began the internal dialogue about the pros and cons of switching careers. But it was during this drive, that a significant question popped into my mind. "If PSO is on strike, what does it say about other orchestras and their future? Is a career in orchestral music sustainable? " At that moment, I remembered a few conversations I'd had with other graduates from CIM, Juilliard and Carnegie Mellon and realized that many of us were asking the same questions. Where will this tradition be in fifty years? Is the current financial and artistic model of symphony orchestras in the US sustainable? What skills does one need beyond being a great musician to compete in the 21st century musical arena? How will I make a living if I don't get into that orchestra? Many musicians graduate with insurmountable debt from music school, practice countless hours, but come back jobless after a dozen orchestral auditions. Despondent, many musicians end up swapping their musical aspirations of getting into an orchestra for a day job that makes them feel like a failed artist. The past year I’ve become obsessed with determining the future landscape of orchestral careers, and learning what millennial conservatory graduates can do to create a sustainable career in music. How will orchestras be funded in the future? What business and artistic direction will American symphony orchestras take in the next twenty years? How much of the future of classical music depends on performing new compositional works to strengthen audience interest? How does the term "Classical" represent or misrepresent the symphony orchestra? What are your thoughts on the social conventions of the concert hall? Should these conventions be changed to attract new audiences? In the wake of 21st century entertainment options (Netflix, digital streaming), what case can be made for the relevancy and accessibility of classical music/Symphony orchestras? What is the role of multidisciplinary collaboration and multimedia inclusion in symphonic concerts? What skills should millennials possess to create a sustainable career in music in the 21st century? Click here to read other posts by Lydia Sewell.